Wow. This sounds huge. Does anyone know how this affects churches? That’s good news. I’m glad to know this won’t be catching any churches by surprise. Now, hopefully the other nonprofits can catch up on time. Wondering when you will get your Federal Tax refund from the IRS? You can easily check your refund status online at the official IRS website here: Get Refund Status. Just enter your Social Security Number, your Filing Status and the refund amount as shown on your tax return, and the IRS will tell you your status in a matter of seconds. I checked my status yesterday, and the site told me that my refund would be direct deposited into my bank account today. I just checked my bank account, and sure enough, the full amount is there. Now I can pay my state taxes and my estimated quarterly taxes for January through March. Yay. According to a recent analysis of U.S. Bureau of Labor Statistics data, America’s poor donate more, in percentage terms, than higher-income groups do. As pastor I make it a point not to know who gives what at church, but I can still testify to the generosity of many people with lower incomes that I have known over the years. Why do you think the poor tend to be more generous with their giving? Check out this nifty budget calculator. Simply enter your monthly take-home income, and the calculator instantly gives you a pie chart breakdown of suggested allocations. 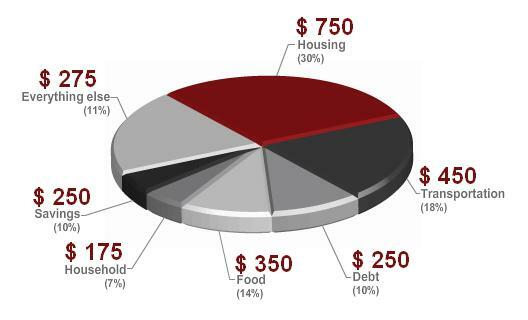 For example, the following chart is based on a monthly take-home pay of $2500. The calculator is based on CNBC personal finance expert Carmen Wong Ulrich’s budget advice. I noticed Carmen does not have a category for giving. So, if you are a Christian committed to regular, proportional giving, then let me suggest that you take your giving out of the take-home pay first, and then enter the remainder into the budget calculator. All in all, this seems like a pretty simple device to help a family or individual get started with a spending plan. If you stack up $1,000 bills, $1 trillion would need a pile that is 80 miles high. $ 1 trillion is more than the combined gross revenues of Wal Mart, Exxon, General Motors and Ford Motors. We could pave the entire U.S. interstate highway system with 23.5-karat gold leaf. So, the total cost of the Marshall Plan, the Korean War, and the New Deal—using all figures adjusted for inflation—is less than that of the current economic stimulus package. That’s how much $1.1 trillion is. And Mary Rose Ryback points out that $1 trillion is more than $1 million spent every day since Christ’s birth. So, yes I know we are in a time of economic trouble, but we should think very carefully about whether and how we are going to spend a trillion dollars that we don’t even have. What do you think? I was breathing and, in general, feeling pretty healthy. My wife gave me a kiss and told me she loved me. I was driving to WORK! I have a job. All of my children have jobs and are safe and well. My two grandchildren still light up my life and give wonderful hugs and sugars. I am a citizen of the greatest nation on the face of the earth and I will get to vote soon on how to make it better. I am still a United Methodist minister. My home is safe, warm, secure and nearly paid for. I got an e-mail that told me my new book was changing their church for the better (someone is reading it). I am actually sitting down in a building I own, at a desk I bought, typing on a $2,000 machine I can barely use. I have a big huge bottle of wonderful fresh clean water right down the hall or I could choose to drink right from the tap all I can hold. I am wearing clean clothes today, and tomorrow I will wear something different. In fact, I could wear something different every day this month if I wanted to. I HAVE A SAVIOR WHO WILL NEVER LEAVE ME. It is a shame that it took losing so much money for me to realize how rich I really am! This week may be one of the best weeks of my life. Gov. Palin released her 2006 and 2007 tax returns last week. Paul Caron over at the TaxProf compiles the main information from all four candidates onto one handy chart. 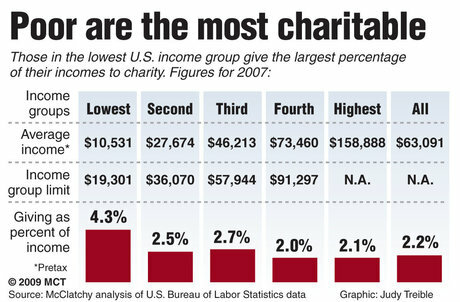 There seems to be a fairly wide spectrum in both reported income and charitable giving. I have mixed feelings over the recently defeated bailout bill. I would like to see the American economy succeed without it, but there are strong indications that some sort of bailout is necessary to keep the economy afloat. Still, no one seems to know whether the bailout will succeed in fixing our problems or only delay the inevitable, perhaps even making things worse. Meanwhile Terence Corcoran at the Financial Post argues that we should let the market correct itself. It would be unwise to read too much into the Dow plunge, or to link it exclusively to the political circus in Washington. Stocks appeared to be heading lower no matter how Congress voted. Indeed, from the moment congressional leaders announced Sunday they had a deal, filled with anti-market schemes and regulation, stock prices began falling in Asia and Europe. Early yesterday, when it was expected the bailout would be approved, the Dow was down 500 points. Bailout or no bailout, the stock markets were heading lower as financial markets continue to undergo massive asset revaluations. No matter what elaborate new rescue packages Congress, the Bush administration and the U.S. Federal Reserve bring to the party, the market is going to continue marking stock prices and other assets down until values reach realistic levels. So, what do you think? Should we be bailing out the bailout? Or let the economy run its course? Here’s a great quote from Jared Bernstein on Treasury Secretary Paulson’s announcement earlier this week on the $700 billion bailout. “The situation is like that movie trailer where a guy with a deep, scary voice says, ‘In a world where credit markets are frozen, where banks refuse to lend to each other at any price, only one man, with one plan can save us,’” said Jared Bernstein, senior economist at the labor-oriented Economic Policy Institute in Washington. And yet, the more he looked at the data, the more Mr. Bernstein became convinced the financial system really does require some sort of bailout. “Things are scary,” he said. I am pretty much a free market guy, but I must admit I am at a loss on this one. What do you think is the best solution at this time? Note: Here are a few articles dealing with the economic crisis from a Christian perspective. Related post: Bailing Out the Bailout?